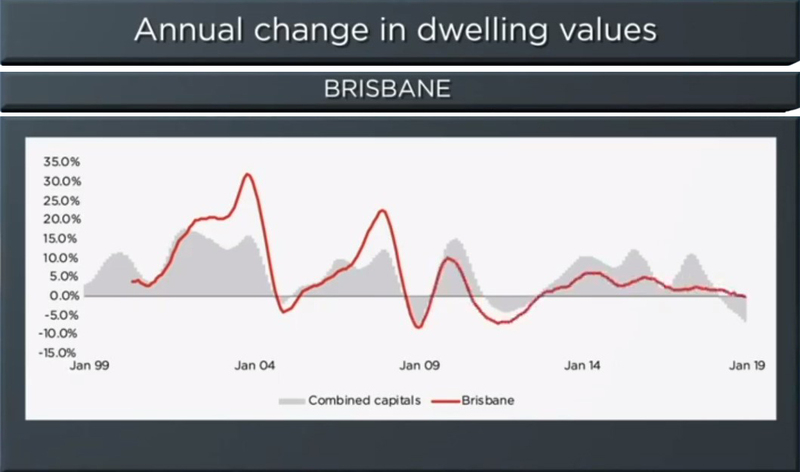 Brisbane`s housing market has remained absolutely flat over the past twelve months, with a 0.1% gain in house values helping to offset the half percent decline in unit values over the year. You can also check out the local reports for Sydney and Melbourne. The Brisbane market has shown a consistently soft performance over the past decade, with dwelling values rising at the average annual pace of just 1.7%. With values rising at pace that is lower than inflation and softer than wages growth, the housing market is much more affordable relative to Sydney and Melbourne where median house values remain $360,000 and $200,000 higher than Brisbane values. This relatively healthy level of affordability as well as surging population growth and stronger rental yields should help to keep the Brisbane housing in positive territory over the year.